During a 2010 mission to document Moche murals decorating the walls of the Pañamarca temple in northern Peru, archaeologists discovered a 1,300-year-old feathered shield. 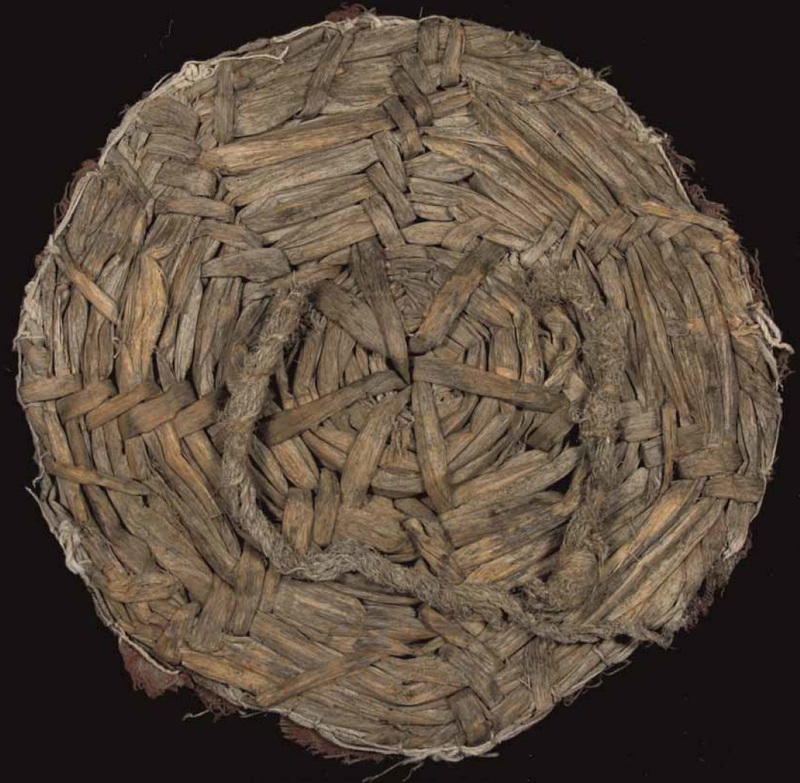 It’s a small circular shield 10 inches in diameter with red and brown textiles sewn to e base structure of basketry weaving. The red textile remains remarkably rich in color and there are a dozen yellow feathers, probably from a macaw, still attached to the front of the shield in a radial pattern, while the back is a coiled basket weave with two vegetal ropes attached in the middle as a handle. Experts believe the entire face was once covered in more than 100 feathers arranged in several concentric circles. This was a delicate object reserved for ceremonial uses, not for combat. Pañamarca is the southernmost Moche monumental site and has been repeatedly explored starting at the end of the 19th century. Although it has often been the target of looters, the temple contains a unique archaeological treasure in the form of murals on almost every wall. Other Moche centers are painted with geometric shapes and repeated motifs of deities and human figures. Pañamarca’s murals are narrative, religious scenes and mythological events, of a kind found only in a single mural at the New Temple of Huaca de la Luna. The Pañamarca artists had a style of their own, possibly inspired by ceramic decoration or tapestries. Despite their singular importance, the murals had yet to be fully documented and recorded. The 2010 field project aimed to rectify this oversight. The team who found the fan was looking for the remains of Murals B and D, first discovered in 1950 but later thought to have been destroyed. Mural B is a painting of a Strombus Monster, a Moche mythological creature with snail and cat-like features. 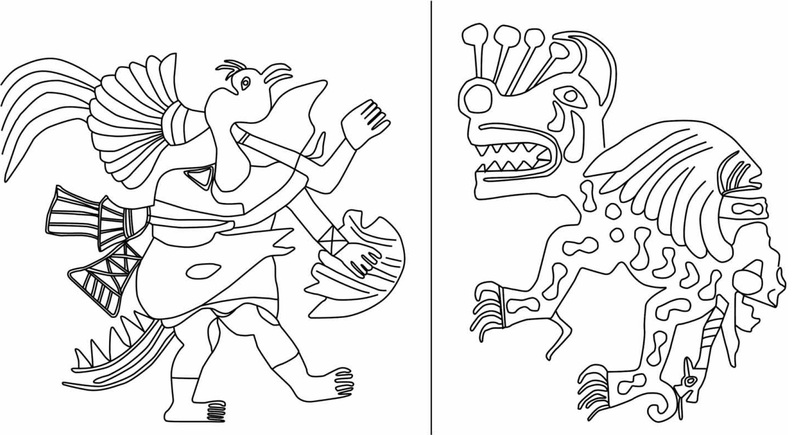 This figure is often found on decorated ceramics accompanied by a hero-god known as “Wrinkle Face.” Mural D is an Iguana figure with a serrated tail who wears a bird headdress, carries a bag and a shell and is often seen on ceramics along with Wrinkle Face. The team only had old drawings to go on and both murals were damaged and incomplete even in 1950 so there are inaccuracies in the sketches. In the monumental core of the temple, sealed off during an ancient renovation and long since picked clean by looters, archaeologists found a small niche-like room with what was left of the Strombus Monster and Wrinkle Face’s Iguana attendant. More than half of the paint still surviving in 1950 is now gone, however what is left has been meticulously recorded so artists could render the murals in proper scale and full color for the first time. When the walls were cleared of sand, debris and rubble of crumbled adobe and mortar, archaeologists realized that the original floor of the chamber had been covered with three layers of adobe bricks. 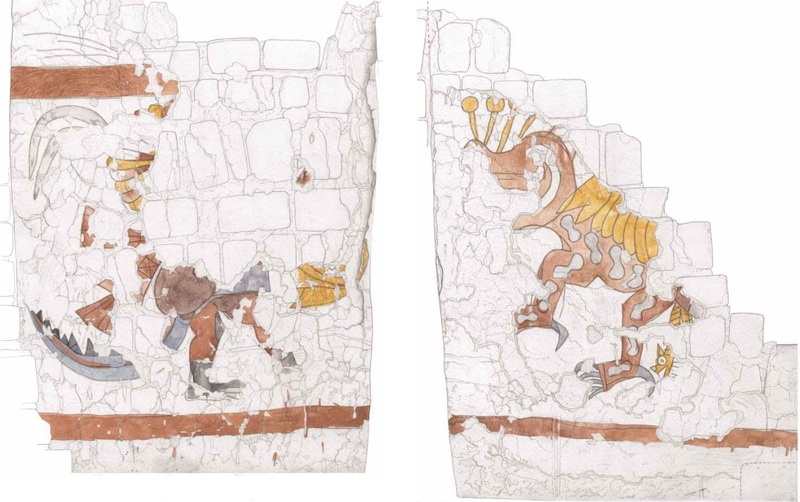 Conservators carefully removed the bricks, revealing the end of the Iguana’s tail and the red bands that frame the top and bottom of the murals. The newly unveiled tail segment had been covered when the chamber was sealed in the late Moche period (c.600–850 A.D.), keeping the polychrome paint in excellent condition. 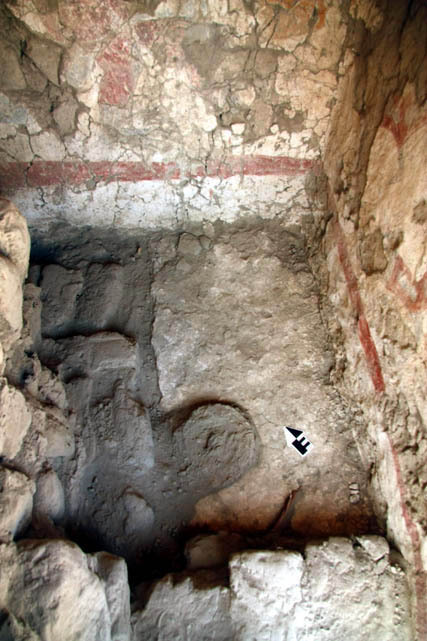 The red, blue and dark blue colors are still saturated and vibrant, an important clue for archaeologists trying to determine the color depth and range of Moche murals. Underneath the last layer of bricks were a centimeter or two of soil. After they removed the thin layer of soil, the team found that the floor had been cut out leaving a sloping surface that could have been used a bench or an altar. They saw a basketry artifact near the edge of the sloped surface. It looked like a simple flat basket with ropes attached, but when they lifted it up, they saw that it was a shield placed face-downward. They identified it as shield because shields are common motifs in Moche art. There are very few actual shields in the archaeological record, however, and none of them are like this one. The others were all discovered in a funerary context, were made of hardier stuff — cane and leather for the shield found in a tomb at Huaca de la Luna, gilded copper platelets attached to the face of an unknown organic material that had decayed before discovery at the Moche center of Dos Cabezas — and are larger. The feathers, if analysis confirms them to be from a blue-and-gold macaw, were imports since macaws aren’t native to the northern coast of Peru. 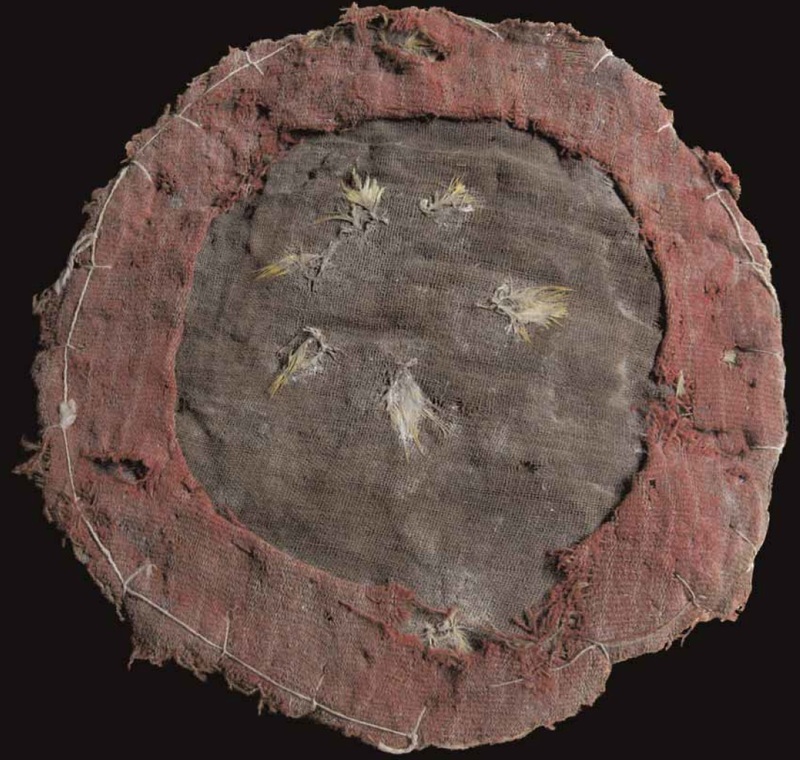 In context, form, material and size, this feather shield is the only one of its kind known to exist. It was probably left as an offering. The shield appears to have been placed in the room right before it was sealed. The paintings were also done right around that time, while the walls are considerably older. At some point between 600 and 850 A.D., the temple was renovated with new murals added to spaces like the core niche. After the painting was done, the shield was carefully placed face down on the altar and then the space was filled with adobe, closing in the shield with the murals for 1300 years.